I definitely go through phases when it comes to my choices of lip colour. There will sometimes be periods where the idea of a red lip fills me with terror and I don’t feel like bold colours suit me at all. Then there’s times where the only thing I’m interested in rocking on my lips is something loud. 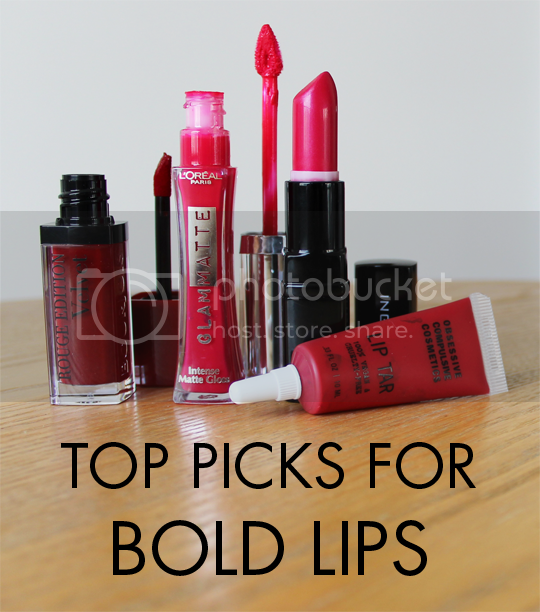 We’re in the latter phase at the moment, so allow me to share with you my top picks for bold lips. Let’s start with this one – Bourjois Rouge Edition Velvet in 08 Grand Cru*. This is a sort-of-new addition to the wonderful matte range which launched earlier this year – I say sort of because it was previously exclusive to Asos, but is now available nationwide. This is, without a doubt, my favourite shade of Rouge Edition Velvet – so punchy and in your face, leaning neither too warm nor too cool so should suit a variety of skin tones (check out how hot Sheenie looks in it!). The formula is great – long-lasting, non-drying and no transfer, feathering or bleeding of colour all in one simple swipe. Far better than the Illamasqua Matte Lip Liquids, that’s for sure, and less than half the price at £8.99. Find it at Boots. Next up, something less widely available but worth the effort to acquire. This is Inglot Lipstick in 140. The formula is rich in Vitamin E and apricot kernel oil which makes it really hydrating and helps the rich berry colour glide onto the lips with ease. Luckily, that doesn’t mean it slides off instantly and in fact it lasts really well. It’ll need reapplying after eating, but if you apply two thin layers and blot after each one you’ll be good for most of the day. If you’re planning a trip to Westfield Shepherd’s Bush you can take a look in person (and struggle not to buy the whole Inglot store), otherwise you can get it online for a reasonable £12. Back to the high street now, with L’Oreal Glam Matte Lipgloss in Cherry Crop*. Using the word lipgloss in the product name is totally misleading as this is far from a lipgloss. It’s pretty similar to the Bourjois Velvets, actually – the biggest difference is that the L’Oreal applies more ‘wet’ and dries down whereas Bourjois is more matte from the get-go. I actually prefer the applicator on the L’Oreal Glam Matte over Bourjois, it’s a teardrop shape which makes it that bit easier to apply with precision around the cupid’s bow and corners of the lips. It’s also a tiny bit cheaper at £7.99 and just as widely available, although there are less shades to choose from. Pick yours up at Boots (or Superdrug, whatever, I just prefer Boots!). Last but by no means least, another one that you won’t find on the shelves of your local pharmacy. OCC Lip Tars are pretty easily available online though, and this one in Stalker is my new obsession. If you’ve never tried a Lip Tar before, I question your sanity. Honestly one of the best lip products on the market – you need literally the tiniest little pin prick of product to coat your lips in some serious pigment, and if you try and apply without a brush you’re just asking for trouble. Lip Tars are a little bit more effort than your average lipstick but SO worth it, with stays-all-day colour (even through eating and drinking) and a flattering satin-like finish. Stalker is less popular than OCC’s original red lip tar NSFW, but it’s blue undertones make it far more suited to pale, cool toned skins like mine which makes it my winner. Find it at Love Makeup for £12. The best thing about a bold, bright lip colour is that the rest of your makeup can be kept so simple, speeding up your getting-ready time, but it always looks like you’ve made a lot more effort than you really have. Teamed with a fresh, flawless base, a bit of bronzing or contouring and a minimal eye look of just liner and mascara, you can’t beat it. One thing I do think is essential when wearing a bold lip is a good slick of black eyeliner – it helps to balance the face without detracting form the lip with should definitely be the star of the show. So, tell me, what are your top picks for bold lips?